Really Filthy - When using "LS" DIRT, for a really filthy or denser look apply a black and/or brown pancake first and then spray "LS" DIRT. This sheet contains Caucasian: Eagles, Skulls, Dragons, Devil and Iron Cross. Sold by the sheet only. 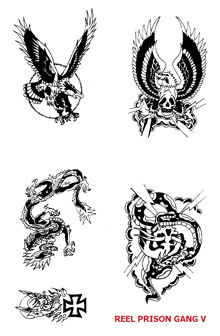 USE SEARCH BOX TO FIND TATTOO OF YOUR CHOICE - example: type in 'eagle' to find all the sheets with eagles on them.